I could have done better. I could have been more creative. I could have, should have! I'll go out on a limb and say most of us have had at least one project we quilted that we knew we could have done more or wished we had done something differently. And of course, a finish is better than not finishing! What did I do and what would I have done differently? I began quilting random straight lines, but not straight as in ruler straight. Let's call these organic. The widths varied from 1/4" to maybe 3/4". Dense, but not matchstick dense. In order to delineate the center from the frame, I quilted organic lines horizontally. It helped, but honestly it is a busy little piece and hard to see or focus on anything! You can see it a little better on the back. Dark blue thread on dark blue backing isn't easy to see! I really didn't have the luxury of setting this aside until I could come up with the perfect quilting idea. But if I could have what would I have cone differently? The possibilities on something like this are endless. 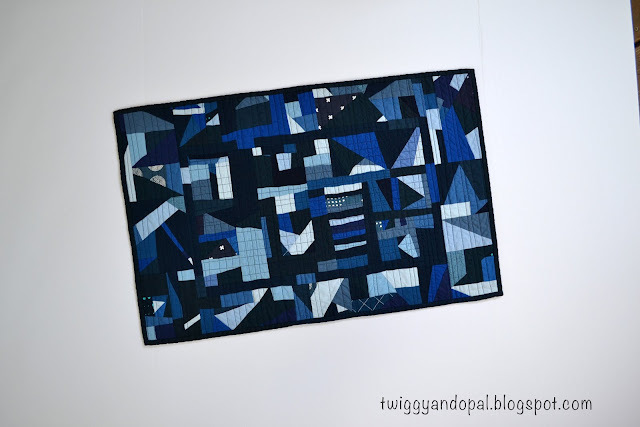 Had I had the time to stare at it for days on end...I'm pretty sure I would have busted out the darning foot and free motion quilted the center in tiny squares of all different sizes. Something like this piece I did last year: Controlled Improv or Chaos. The outside I would quilted the sides in horizontal lines and the top and bottom in vertical lines. Or...I would have sectioned it out and quilted spiral squares. Or...lots of pebbles! You can see what I'm saying! With enough time to think, there are a lot of choices! I'm not saying I'm disappointed with this quilted finish at all. It just makes me want to do better next time! 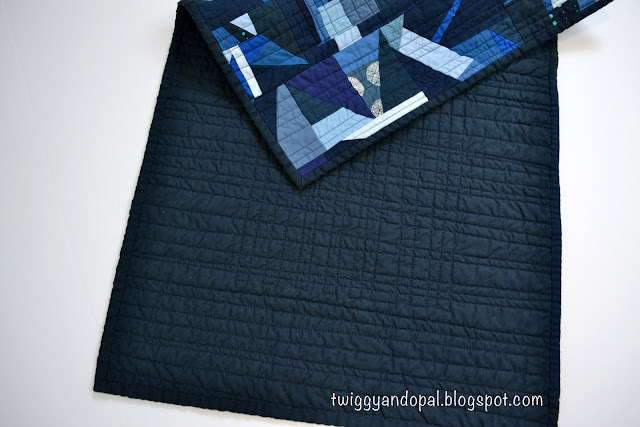 Have you had a quilt you just wanted to get quilted and be done with and were left underwhelmed? Haven't we all? Especially us newbies. Regardless, I love it! It isn’t limited to newbies!! There are times when you just have to sit back and wait for an idea! I think everyone has at one time or another. 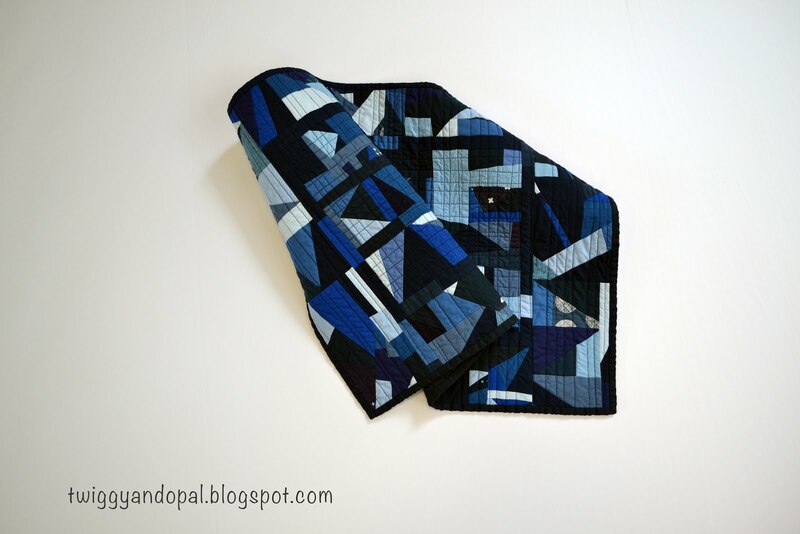 I do like how you quilted this piece however. I do think that we have all been underwhelmed with our decisions at one point or another. I think the quilt finished fine; as you say it has a lot going on and would have been a lot of effort to quilt areas densely and differently. There are times when ‘underwhelmed’ is the exact way to go! I may have done something different, but I try to remember that I can do that on the next one! of course I have. But you still have a really wonderful finish and things to consider for next time. It's all good! I like it the way it is! 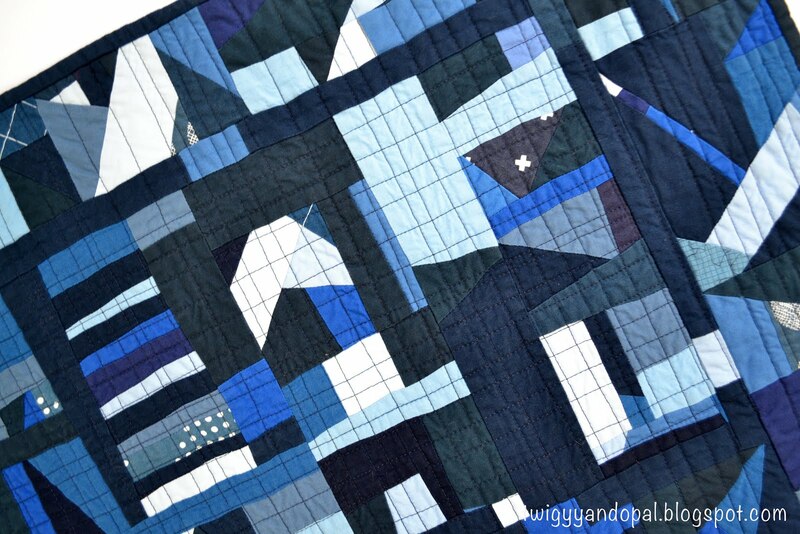 The quilting fits the improv theme of the piecing. Just keep those ideas in mind for the next one! I may not be jumping for joy over it, but I’m totally content with how it turned out. Theres always next time! 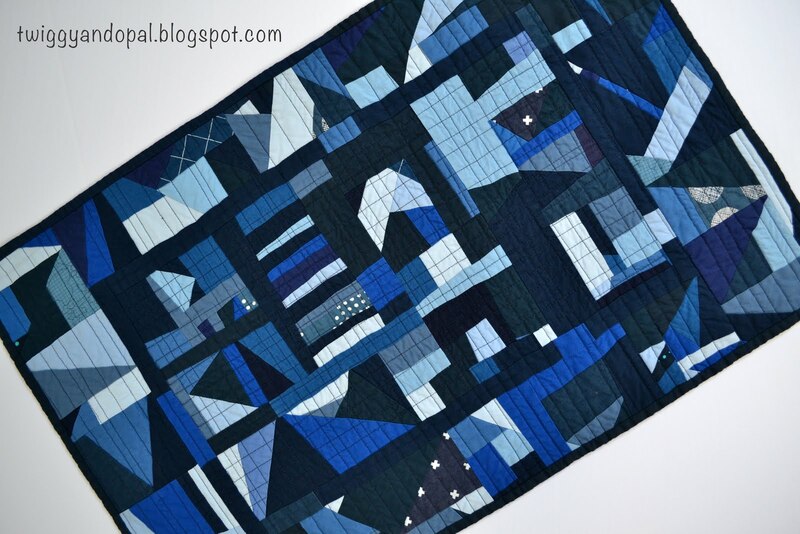 Due to deadlines, I don't often get to spend a lot of time mulling quilting decisions. But usually, I am the only one that is disappointed. We are always out worst critic. I think it looks great! Yeah, the three little quilts I just finished were all a bit "meh" on the quilting. But they are toddler quilts, so they just need to be soft yet sturdy! Well, quite frankly, I say the same thing every time I try improv. Let's just say that I don't like improv, and improv doesn't like me. I do think it's good to push ourselves outside our comfort zone, but then to remember that it was a stretch and to not be too hard on ourselves afterwards. It's a lovely finish despite the fact that you are not so over the moon about it. Yup....I'm still fairly new at quilting my own quilts so I often am underwhelmed with the results.....but I keep getting better so there you go. Have you had a quilt you just wanted to get quilted and be done with? Yes my very first own design I was so proud of and didn't quite ruin it with the quilting but very close to it! We use it on the sofa now and I am back to liking it again! Time pressure projects are the worse, when I really feel like it just has to get done. 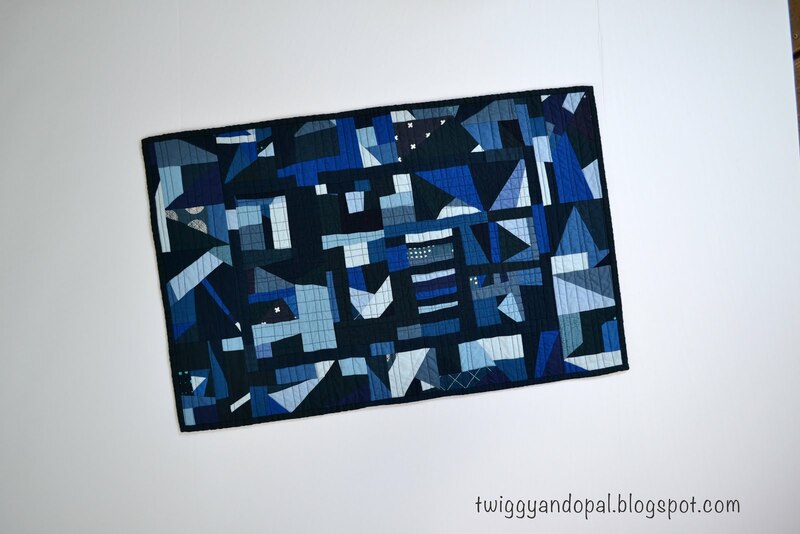 I think the quilting pulls all the pieces together. So maybe it's not your favorite, but sometimes it's just too true that done is really better than perfect.